Owner: There were originally three people in the partnership (this is where the name originates), but that has since grown to six. To keep the significance of the three there are three families now in the partnership. The owners are Matthew Murphy, Janet Hopper, August Perez, Monica Murphy-Perez, and Carla and Tim Shannon. Murphy is the executive chef and Carla Shannon is the manager. Atmosphere: When designing the restaurant, the Three Blind Mice staff wanted to give it a casual, bistro feel but also create a place where customers could come for a special occasion. They use butcher paper for tablecloths to create a relaxed feel. They offer many different seating options including high-top tables and regular tables. Bar seating and outdoor seating are available too. The bar area has two flat-screen TVs, but do not let that draw your eye away from the aesthetically pleasing small features of the furniture and decorations. The owners wanted to create a very unique and homey environment so they used furniture that has a story behind it. For example, the table under the glass wine caskets was once a farmer’s table. The lighting fixtures along the walls are reused pieces of old wine caskets from Portugal. The owners tried to stick to rustic accents for decor. The space was originally two different suites, and they combined the two to create a larger space, completing most of the renovations themselves, even staining the floor. Three Blind Mice is family friendly and has a children’s menu. 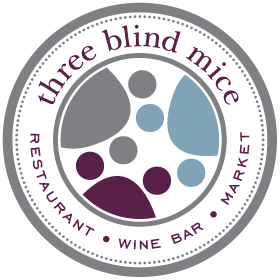 Menu: Three Blind Mice uses all fresh ingredients and makes all dishes from scratch, requiring menu changes to keep with what is in season. The breakfast menu changes daily, and each day they write what is on the menu for the morning on the large chalk board in the bar. This gives the restaurant more of a coffee shop feel in the morning. If you are looking for a large breakfast try their Sunday brunch. They offer many great items including eggs Benedict. Dinner and lunch are their busiest meals. The food has a homemade quality. Some of the customers’ favorites include the Steak Diane, lump crab cakes and the iceberg salad. All three of these items have survived all menu changes. In the mood for dessert all day? You’re in luck. The most popular desserts are the sticky toffee pudding and the New York-style cheesecake. Three Blind Mice takes pride in its alcohol selections available. There are 90 to 100 different kinds of beer, with six on tap. There is also a broad selection of wines coming from more than 20 countries. On top of their large beer and wine selections they also boast a full bar with a range of spirits. If the selections are overwhelming, you can try different ones at the weekly wine and beer tastings. Every Sunday, Three Blind Mice hosts a beer tasting at 6 p.m. — six beers for six dollars. On Wednesdays there is a wine tasting from 7 to 9 p.m. that costs $15 per person for six wines to try. You can do your wine tasting casually in the lounge area or with dinner. The mission at Three Blind Mice is to introduce people to wine in a relaxed environment, so they offer these wine tastings as more of a service rather than to make money . Along with their full bar their drink selections include a wide variety of coffees and teas, soft drinks, sweet and unsweetened tea, fresh squeezed lemonade and mineral water. Things you might not know: The “blind” part of the name comes from blind wine tasting available to broaden customers’ knowledge of wines by not knowing specifics before you know taste.